A Patriots fan decided it would be a good idea to attempt to sneak into New England’s locker room during Super Bowl LIII. He was wrong. 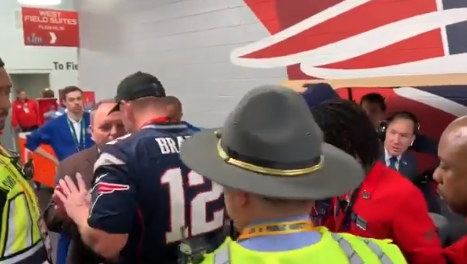 Check out this video of a man wearing a security jacket trying to get into the Patriots locker room before getting stopped by security guards. The jacket might have been legit, but his credentials indeed were not. In a moment that might as well be straight from Scooby Doo, security takes off the dude’s jacket, and he’s wearing a Tom Brady jersey. It’s unclear whether the man was arrested or not. I have no idea how the attempted locker room intruder obtained a security jacket. But, it still wasn’t enough to trick real security – who should be commended for stopping this guy from getting in the Patriots locker room. It might seem funny on the surface, but who knows what the Pats fan would have done if/when he would have gotten close the Patriots.